Autumn is now upon us. There’s a chill in the air, falling leaves, and falling prices at Omlet! 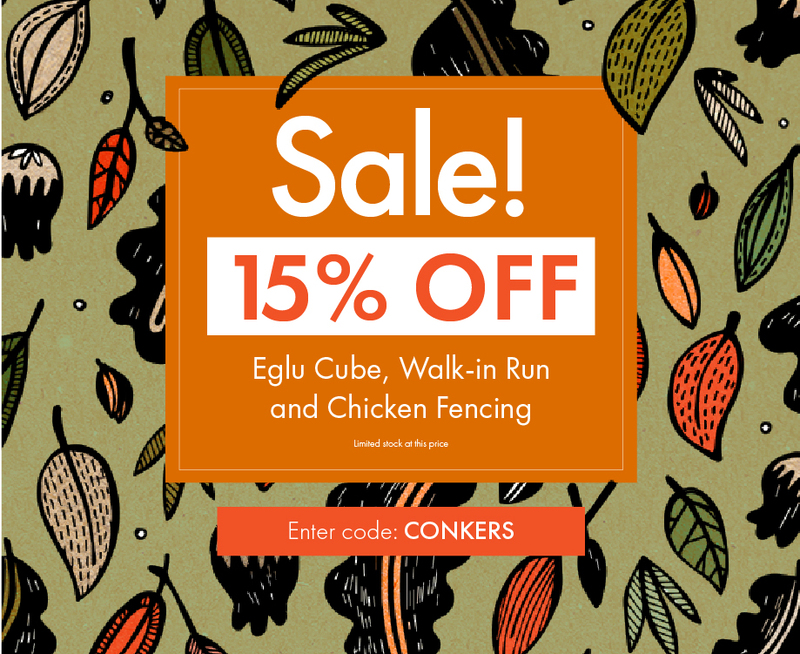 We are offering an eggtastic 15% discount off Chicken Fencing, Walk in Runs, Eglu Cube Extensions and Walk in Run Extensions for a limited time. There is limited stock at the discounted prices, so grab a bargain while you can! It’s important that you provide your pets with enough space to play in every day while keeping them safe with a Walk in Run from Omlet. New and improved, this range of fox-resistant pens look great whilst blending into the garden. These large enclosures are spacious, extendable and designed to work with any kind of pet house or coop. Your pets will love their high quality run and you will enjoy being able to walk right in to spend time with your pets. If you’re looking for some poultry netting to fence in your chickens, this is a great choice. This handy chicken fencing comes in green, to blend into your garden. It is available as a 12, 21, 32 & 42 metre roll and is very easy to put up and move about. Use this poultry fencing to keep your chickens within an area, giving them more space to roam or, of course, out of a part of your garden, like your prized vegetable patch! Quote CONKERS at checkout to claim 15% discount for a limited time!! The Eglu Cube Chicken Coop is the ideal way to keep up to 10 chickens in a town or country garden. This plastic chicken house has a slide out dropping tray, wipe clean surfaces, twin walled insulation, no maintenance and No Foxes Allowed protection. The easy to move Eglu Cube hen house with extendable run makes it simple to keep a large flock of hens in your garden and leaves you with more time to enjoy the pleasures of keeping chickens. Now is the perfect time to upgrade to a cosy Eglu Cube before the winter sets in! 15% off promotion is only valid from 25/9/2017 for a limited time. Quote Promo Code CONKERS at checkout to claim the 15% discount. Subject to availability – there is limited stock at the discounted prices. Omlet ltd. reserves the right to withdraw the offer at any point. Discount is only applicable to Chicken Fencing, Walk in Runs and Eglu Cube Extensions. Discount cannot be transferred to delivery or courses. Excludes delivery. Offer is only valid on fully priced items and cannot be used on existing discounts or in conjunction with any other offer.